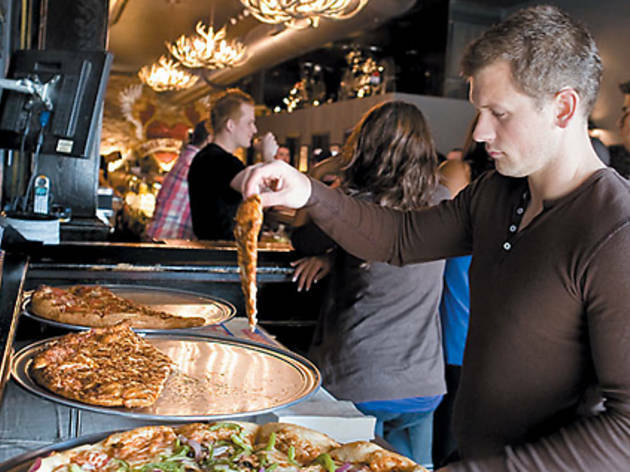 Even if there's no such thing as a free lunch, savvy cheapskates can indulge in gratis buffets, cocktails, cupcakes and more-with no binding strings attached. The best part about the drinks at this swank bar’s free Wednesday-night reception? The view. Pick a cocktail and then take a seat on the canopied benches that line the seventh-floor bar’s outdoor deck. If you’d rather soak up NV’s soft green lighting (for eNVy, get it? ), grab a seat at the reserved tables. The only thing better than free booze is free booze in the form of a cupcake. Stop into this tiny, sleek bakeshop after work on Fridays, and you’ll be greeted by trays of free cocktail-inspired mini cupcakes. The flavors change frequently, but recent selections included Cuba Libre (chiffon cake with rum-infused frosting) and Lemon Drop (limoncello cake frosted with vodka-tinged buttercream). Free food is easy to find. Organic, locally grown free food is pretty rare. Chef Brian Millman’s appetizers make the rounds at this speaker series and networking event at the environmentally focused Edgewater restaurant. When it comes to midnight bar buffets, if it’s free and not reheated from Costco, it’s hard to argue. 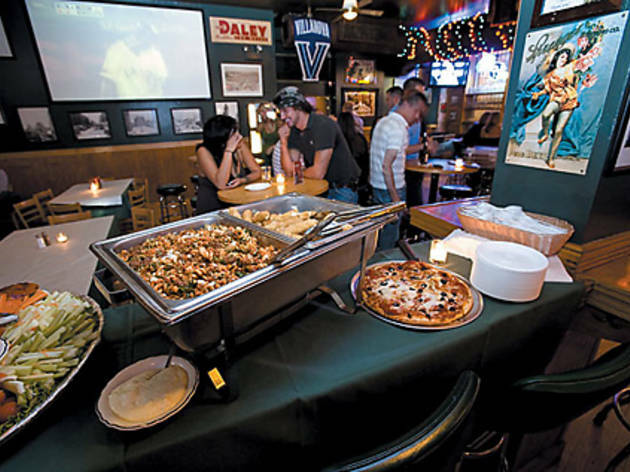 Still, the mac and cheese, veggies with dip and pizza here are decent enough that not even neighborhood yuppies bat an eye before piling dozens of wings onto appetizer-size plates. “Chef Susan” of Cardamom Kitchen regularly leads free cooking classes at WFM. This month’s “Gluten-Free Baking: Cookies!” will teach you how to bake chocolate-chip and sugar cookies. Or rather, how to eat them. Uptown’s ebullient queer saloon has been serving up a year-round Sabbath supper for two decades. Folks love it for the all-you-can-shove smorgasbord of carny- and veggie-friendly dishes like burgers and tofu dogs with fruit salad in the summer and heartier fare like lasagna and mixed greens during the winter. The word about Fion’s Friday wine tastings may not have spread, but that’s the reason to go: The light attendance spells attentive service and a relaxed, frat-free atmosphere for kick-starting the weekend with a mini flight. 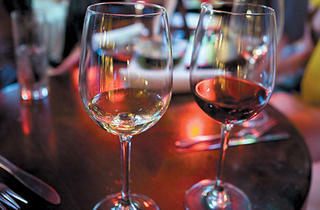 The cozy wine bar offers ample, if not generous, rotating samples of two whites and two reds. You’re likely to make at least one new discovery—it was the Zuccardi Malbec Serie A for me. While free drinks and no cover might lure Wicker Park barflies to Debonair Social Club for these nights, the real fun comes from a campy vibe that’s often scarce on weeknights. DJs spin at Rehab parties (R.S.V.P. to going.com), whereas local burlesque artists take the stage for No Tell Motel (no R.S.V.P. required). Faith & Whiskey hasn’t been around for long, but it has already reconcepted (it’s now the “new” Faith & Whiskey). 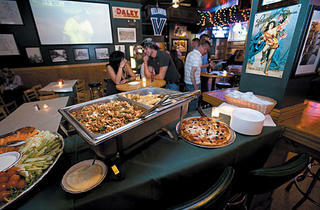 The best part of the revamped rock bar is Faith Fridays, where a table near the door is piled with veggie and sausage pizzas and wings. 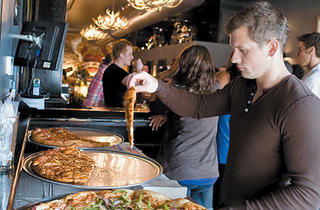 Bartenders at Bucktown’s reigning beer bar know nothing goes better with barbecue than a nice cold one. So they lead the horses to water by setting out a spread of ’cue from Leon’s each weekend day around noon. The fried chicken and hot links are actually tastier than the ribs, but these aren’t bad bones—especially when they’re free. Any wine shop worth its corks will have at least a few free tastings a month. These stores understand that the best way to get customers to buy a bottle is to let them taste it (not just gawk at the pretty label). The tastings are often hosted by a winemaker or distributor (a.k.a. somebody heavily invested in promoting their brand). Expect to try small pours of three to six wines. There’s a lot to be impressed by at the 15th-floor hotel bar of this Holiday Inn. 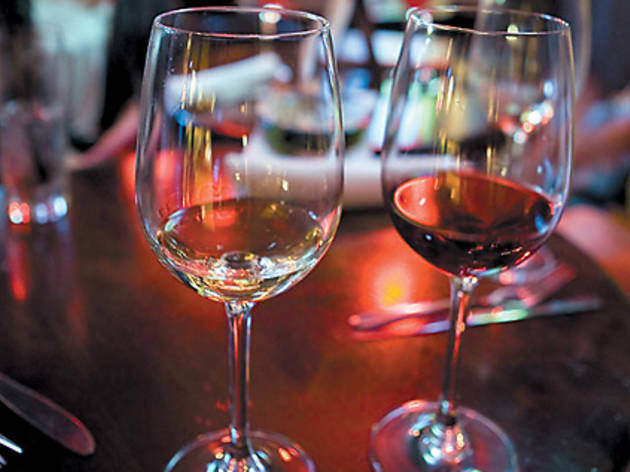 Take the gorgeous views of the city and the Chicago River, for one, or the incredibly affordable wine list, which includes a good number of generously poured glasses for $5 and up. To sweeten the deal, the bar has a little complimentary buffet (all brought in from the adjacent Italian-Asian fusion restaurant Italiasia).